The article I wrote before the start of the season included research on the starts made by the 10 teams winning automatic promotion from the Championship in the course of the last five season. This research can be seen in the chart below. Taking a look at the top of this season’s Championship so far may help pick out the main contenders. 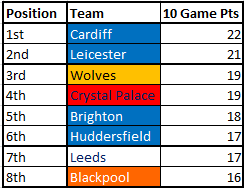 For the sake of including Blackpool, I have displayed the top eight sides. If the pattern of the last four seasons is to continue, then Cardiff look well-placed to seal a debut season in the Premier League in 2013/14, while Leicester and Wolves should also consider themselves to be strong favourites. All the teams down to Leeds in 7th have hit the magic 17 point mark, with any sides below that needing to break the mould a la Reading last season. Based upon this, it doesn’t seem unreasonable to assert that Blackpool currently have around a 10% chance of automatic promotion. The optimists amongst you might perhaps view this as being too negative. One valid criticism of this research would be that the sample size is too small – how can this possibly stand up over just five seasons of data? Bearing that in mind, I’ve gone back further and researched an additional five seasons to see if this changes any of the conclusions drawn – the data is in the chart below. The larger sample size still stands up to many of the same conclusions as before, backing up the likelihood of just a 10% chance of automatic promotion based on Blackpool’s current points total. 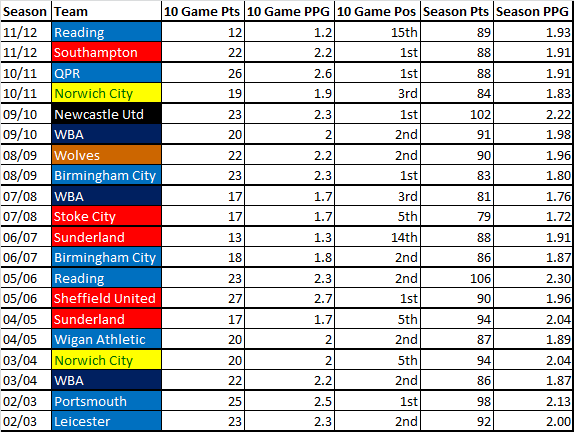 In the last 10 seasons, the team finishing in 2nd place has scored an average of 87 points. Having scored only 1.6 points per game so far, Blackpool would need to increase that to 1.97 for the remainder of the season to hit 87 points – a considerable ask, although of course a lower total might still be enough to clinch automatic promotion. It is still early days, and with 36 games to go there is still much that could happen between now and May – ‘Pool are still there or thereabouts despite a recent wobble. As Reading and Sunderland have proven in the last 10 years, it is possible to turn an underwhelming start into end of season champagne. Yet the findings from this research should not be dismissed – Blackpool do have an enormously difficult challenge on their hands if they want to achieve their pre-season aim, with the play-offs currently looking like a more plausible means of securing a return to the Premier League.